The man who warned in 2006 about the potential downside to modern financial innovation gets the job of fixing a big, fat mess. 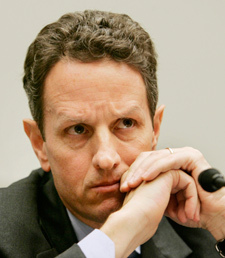 New York Federal Reserve president Timothy Geithner testifies at the U.S. House Financial Services Committee about financial market regulatory restructuring in Washington July 24, 2008. Jim Cramer will be devastated, the Lawrence Summers-hating left will be relieved, and How the World Works is flat out delighted: NBC News and the Wall Street Journal are reporting that Barack Obama's pick for Treasury secretary will be New York Federal Reserve Bank president Timothy Geithner. My reason is simple: Back in 2006, while most of the financial establishment was pooh-poohing the possibility that the global economy was at any risk from a systemic shock, Geithner was actively warning that unregulated derivatives posed a threat to financial market stability. For the most part, as is typical of central bankers, Geithner stakes out a careful, cautious stance that treads familiar ground: the difficulty of striking the right balance between regulatory supervision and unfettered market efficiency. But his caution surrounds a dangerous core: Geithner acknowledges that the explosion, over the past 10 years, of hedge fund trading in exotic financial instruments may well have contributed to the general resilience that the U.S. (and global) financial system has demonstrated in response to external shocks since the Asian financial crisis of the late '90s. And yet he surmises at the same time that the very flexibility of the current system may actually make it more vulnerable to a really, really big shock. Financial panics start when traders and bankers who call in loans or sell off their holdings at the first sign of trouble set off a cascading effect in which everybody else follows their example and the system implodes under the strain. Paradoxically, Geithner appeared to be saying, the more flexible the system, the more quickly such a cascade could happen, and the harder it could be to stop. "The same factors that may have reduced the probability of future systemic events, however, may amplify the damage caused by and complicate the management of very severe financial shocks. The changes that have reduced the vulnerability of the system to smaller shocks may have increased the severity of the large ones." That's a subtle argument, and we're not going to know whether it holds water until the flood is already 5 feet high and rising. Naturally, given my own fixations, the first thing that came to my mind was yesterday's editorial in the New York Times worrying about the proliferation of mortgage-backed securities, and wondering what would be the consequences of all the current musical-chairs-like trading in mortgage risk in the event of a prolonged housing bust. Will that be the backbreaker? As we are all too well aware now, the proliferation of mortgage-backed securities and their derivatives did indeed break the back of the global financial system. Before the storm fully broke, Geithner made heroic efforts to get Wall Street's biggest financial institutions to voluntarily come together to rein in the wild west world of credit swaps. But without the active support of the White House or a succession of Bush administration Treasury secretaries, he was just one man attempting to bring order to an entire territory of outlaws. Now he gets a chance to be the top sheriff, with the full backing of an administration determined to find a new balance between regulatory supervision and market freedom. It's a smart pick. And while it's always foolish to read too much into any particular swing of the Dow Jones Industrial Average -- there's no ignoring Friday's late afternoon skyrocket: The Dow jumped 494 points. Whether we should be happy that Wall Street is happy is, of course, a valid question.